Nāropa (1016-1100) was an Indian tantric adept and scholar who is counted among the 84 Mahāsiddhas, or great adepts. He is widely revered in Tibet for his tantric instructions. According to one of his traditional biographies, Nāropa was born to royal parents in a Brahmin family of Bengal. Nāropa’s former wife (or sister according to some sources) has been identified as Niguma, who became an influential tantric teacher in her own right. Nāropa received monastic ordination and in 1049 entered the Buddhist University of Nālanda, in present-day Bihar. He excelled as a scholar and subsequently served a term as abbot and senior instructor at Nālanda, where he was given the name Abhayakīrti. She challenged the level of his spiritual insight and, through her provocative intervention, the prodigious scholar realized that although he understood the literal words of his religious texts, he did not yet fathom their underlying meaning. The woman compelled Nāropa to abandon his post at the university and seek his destined spiritual master, the great tantric adept Tilopa (988-1069), a figure about whom scant historical information exists. 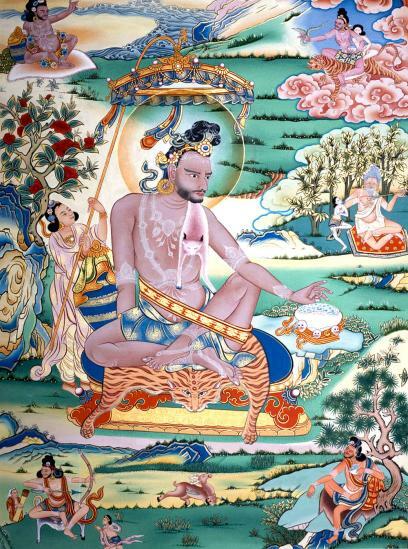 During his extended search across northern India, Nāropa repeatedly encountered Tilopa in various guises, although he was unable to recognize the Guru in his true form. Finally, as Nāropa was driven to the brink of despair and even suicide, Tilopa revealed himself and accepted the seeker as a worthy disciple. In the ensuing years, Tilopa famously subjected Nāropa to a series of 12 greater and 12 lesser trials, inflicting upon him the most terrible forms of abuse and physical punishment. Nāropa persevered, however, eventually coming to understand these ordeals as a means for purifying his past negative actions. At the bank of river Bāgamatī, in the premise of Hindu shrine Paśupatinātha Temple, there is the cave where he was initiated by Tilopa and attained Siddhi. Nāropa later codified these instructions and transmitted them to his own principal disciples, including the Tibetan translator Marpa Lotsawa (1012–1097), who then carried them to Tibet. The Kagyu School subsequently came to view Nāropa as an important founder of their lineage. Several works of spiritual songs and tantric commentarial literature attributed to Nāropa are preserved in the Tibetan Buddhist canon. Later in his life Naropa stayed in Phullahari, where he died aged 85.